As the Earth’s nearest planetary neighbour, Venus has been studied by ground-based observers for centuries, and has been visited by more than 20 spacecraft. However, in the last decade and a half Venus research has been relatively neglected, despite the fact that a great many major questions about its atmosphere, surface and interior remain unanswered. Several of these questions relate to the unique position of Venus as the Earth’s near twin, in terms of size, density and proximity to the Sun, which led early astronomers to expect an Earth-like environment on the planet, possibly one fit for human habitation, and perhaps even the seat of indigenous life. The picture which has emerged from missions to the planet is quite different, raising questions about the evolution and stability of terrestrial planet environments that are both intriguing and possibly of practical relevance to global change problems on the Earth. 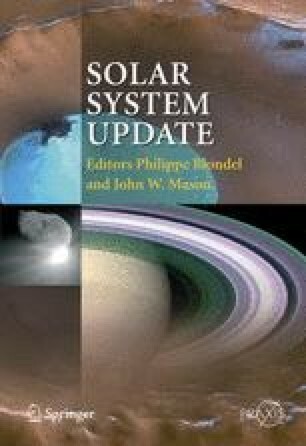 This chapter reviews the scientific issues, and goes on to describe two new missions to Venus, the European Venus Express and the Japanese Planet-C orbiters, which will take place in the next few years to address some of them in depth. Other questions will remain unanswered, and further missions will be required, including landing on Venus and sample return.